Clear skies. Low 36F. NNW winds shifting to SSW at 10 to 15 mph..
Clear skies. Low 36F. NNW winds shifting to SSW at 10 to 15 mph. 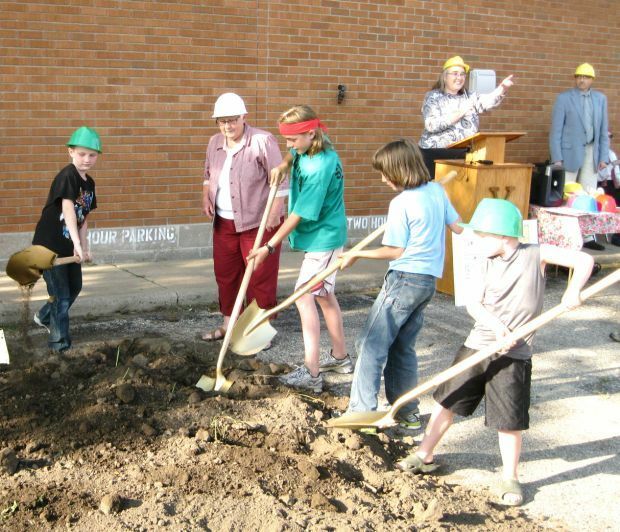 Viroqua Library Board President Kathy Hanson keeps an eye on several children who participated in the ground breaking for a new library in Viroqua on Thursday. In the background are Librarian Trina Erickson and Viroqua Mayor Larry Fanta. The tentative plans for a new Viroqua library were displayed at a groundbreaking for the facility, Thursday. Partners for the new Viroqua library were the first to wield the shovels at the ground breaking at the facility, Thursday. Among the partners are: The city of Viroqua, Western Technical College, Gundersen Health Systems, Vernon Memorial Healthcare and the Viroqua Area Foundation. The community of Viroqua broke ground for a new library during a reverent ceremony in the city's downtown late Thursday afternoon. The event brought together partners for the library including the city of Viroqua, Western Technical College, Gundersen Health Systems, Vernon Memorial Healthcare, the Viroqua Area Foundation and those who administer, volunteer for and use the city's existing McIntosh Memorial Library. 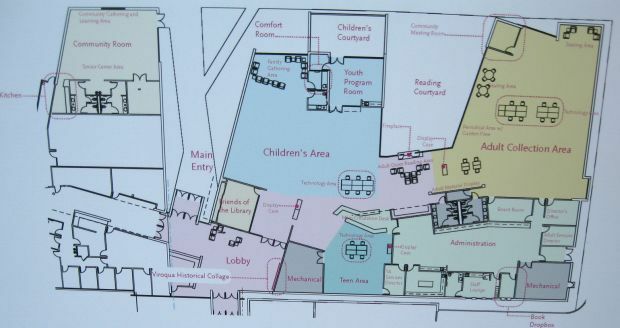 Library director Trina Erickson said the groundbreaking marks 56 months -- nearly five years -- since the library's committee voted to form a task force to consider building a new facility. The new library will cost approximately $3.5 million. Details on interior and exterior finishes for the facility are still being worked out and there is no exact completion date yet for the project. Erickson thanked all of the partners involved "for helping us to create these amazing plans that will soon be developed into a new public library, community room and senior center for our area." The new library will be built on the site of the former Gundersen-Vig Clinic in downtown Viroqua. Gundersen Health Systems donated the land to the project. Viroqua's Western Technical College campus is located immediately to the south and the library and campus will be joined by common space. Viroqua Area Foundation is handling the fundraising for the project. Foundation secretary Angie Lawrence said more than half of the $3.5 million has already been raised. Viroqua Mayor Larry Fanta proclaimed, Thursday, Aug. 8, 2013, McIntosh Memorial Library Day as an ode to the city's aging library. Fanta said the old library has served the community since 1898 and currently has more than 7,000 members who checked out more than 150,000 items last year. Library board president Kathy Hanson said it was uplifting to see the crowd of approximately 150 people who attended the event. "We have had many meetings and have done a lot of planning to get to the point where we are today," Hanson said. "We are excited. This is our kick-off day. We are ready to start the next phase." Third District Congressman Ron Kind (D-La Crosse), who attended the event after holding a listening session at Viroqua High/Middle School, said the partnerships Viroqua has made for the new library are impressive. "It's classic for Viroqua to see this type of partnership, this type of coalition," Kind said. "...It's nice to see this spirit alive and well here in Western Wisconsin and perhaps it's no better or stronger than right here in Viroqua. When something needs to be done in the community you all know how to step up, participate, help out and make sure it does get done." How much did those fake hard hats for the photo op cost tax payers?